M5 motorway suitable for driverless lorries, a recent report has claimed. INRIX, one of the world’s top traffic monitoring organisations, says that the M5 motorway is the second most suitable road in the United Kingdom for driverless lorries. The report was released following a crash on the M5 that led to the deaths of two individuals and serious injuries to four other people. 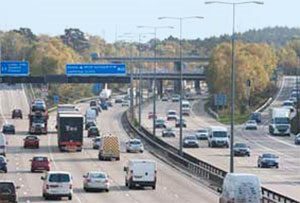 The INRIX report found: "The M25 circling London recorded significantly higher levels of dangerous slowdown incidents per mile than any other corridor. The report suggested that using drone technology for driving lorries could ultimately reduce the number of crashes involving heavy goods vehicles (HGVs) in major roads. In 2017, the Government has announced that it would fund the trials that aim to make UK roads safer. The trials are to be carried out by the Transport Research Laboratory. During the trial, it has been agreed that all lorries will have a driver ready to take control if needed.